Who said that modest clothing has to be old and boring? Dressing in an appropriate and ‘decent’ way can also be an opportunity to explore some of the latest fashion trends. Here you will find eight secrets regarding what to choose and how to be stylish while keeping a modest look at the same time. Straight from the nineties revival we are living in, here you have turtleneck tops. A staple for winter look since they will keep you warm from colder weather, turtleneck tops are extremely trendy and versatile, and you can pair with different pieces to obtain stylish results. This extremely simple outfit features dark slate blue high waisted pants and a light walnut brown turtleneck top. Dark red oxford shoes finish it off by adding a touch of color. The whole outfit is modest, comfortable, and perfect for work and everyday life. Overalls have been a must have for fashion victims in recent times, and why not choosing them along with a colorful turtleneck top? This pairing has a young vibe but is also perfect for a decent and covering outfit for modest dressing fans. Match some white sneakers to keep it sporty and cozy. Midi and maxi skirts are perfect if you’re aiming to find a piece of clothing which is not only modest but also fashionable: they are now not only a spring summer trend but a perfect fall winter item too. Choose them glittery and in metallic colors for parties or special evenings, or go for this basic colors carefully styled. Pleated skirts are a huge trend this winter, and to keep the look simple and modest, we chose a basic neutral color option. This olive green goes perfectly with a simple plain white t-shirt. To avoid being cold choose a furry coat in light colors such as creme white or beige. This is a perfect example of modest look for evening events and special occasions: fashion expert, blogger, and editor, Miroslava Duma, is wearing a delicate light sepia blouse with an ankle length white skirt covered in a floral print. The outfit is elegant and refined, perfect for every age. As maxi skirts, maxi dresses are a valuable option for everyone looking for a fashionable modest look. They cover everything, hence perfect for winter, and they can be found in almost every color and pattern. You just need to do a quick search to find plenty of options and discover the one that’s just perfect for you. As we saw in the outfit before, floral is still a big trend this winter, and this dress, in colder and darker tones, is perfect for the season. Not only for parties and events, but also for daily trips and days out; this dress will be super comfy with a pair of flat ankle boots. The long skirt, long sleeves, and boat neck are perfect for combining modest with fashionable. This romantic maxi dress will be just perfect for every evening and night occasion, from random parties to Christmas Eve and New Year’s Eve. To keep it modest, go for a simple and natural make up and avoid strong colors: the red magenta itself will be enough to spice up your outfit. Palazzo pants have been around for a while, and their size has gone bigger and bigger, making them flowy and comfortable, versatile and perfect for several ages and occasions. Gold is the perfect holiday season color, but to avoid excessive and eccentric looks, these palazzo pants are just perfect. Details are simple yet trendy, and they can be worn in different ways and styles, pairing them with a total black look or with white for lighting up your outfit. If you are looking for something to wear on a daily basis, in your office hours or just for running some errands, keep it classy and comfy with these sandstone palazzo pants. Modest but elegant, you can wear them with a black turtleneck and Oxford shoes to look on point. Collars are an amazing way to add a stylish touch to a plain outfit while keeping it simple and modest. Choose pearls if you’re looking for an elegant allure, or rhinestones to give light to your face and your whole outfit. Rhinestones embellished collars are not only easy to find in almost every clothing shop or accessorizes shop, but are also a cute DIY project you can try by yourself if you want to create a tailor-made collar. Possibilities are virtually endless: go for a total white, with golden or silvery touches, pick a total black outfit and a darker nuance collar, choose small stones or macro ones. You can find collars perfect for day and night, and wear them on a simple sweater with a longuette skirt or some high waisted pants. This lace shirt has a beautiful pearl collar, but you can again use this as an inspiration to do it yourself or to buy a pearl collar itself and wear it with your outfits. Pearls are perfect for both day and night, and they would look perfect on plain colored dresses for special occasions. Along with long coats, long cardigans are hitting the streets this winter. Again, we can find a piece of clothing both fashionable and modest, versatile in colors and matchings, in textiles such as wool and suede or furry options, perfect for being stylish despite the cold weather. You can go for thigh-length or knee-length, but for real fashion victims ankle-length will be perfect. Here you can find inspiration for a daytime look featuring a pecan brown long cardigan, a light olive green top, black skinny pants, biker-style boots, and a long necklace to light the outfit up. Despite being casual, this look is perfect, together with a long coat and a beanie hat, for a young and fresh modest style. This long cardigan is, as we said before, an ankle-length woolly item simply perfect for winter. An elegant pearl white that matches perfectly with the total black dress underneath and with the black wedges. The whole outfit is modest and fashionable, yet cozy and ideal for both day and night occasions. Striped prints are an evergreen, and are perfect to give a touch of color to every outfit. It’s an ideal print to jazz up dresses and basic outfit. Black and white, always a staple is a never ending trend that you can use in this season too, mixing and matching your outfit with accessories and shoes on the same nuance, such as brown, grey, and other neutral earthy tones. 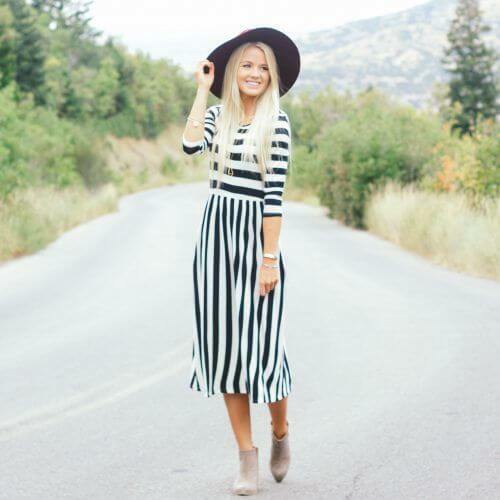 Black and white is an evergreen, and so are stripes. While this outfit may look too much of a spring/summer option, if you throw a long coat on top it will be just perfect along with the light brown ankle boots and matching hat. Just as we said for black and white stripes, same goes for polka dots. In modest clothing, the key is to reinvent outfits and combination inspired by everlasting trends. Polka dots are another perfect print for modest and fashionable clothing, both fresh and young but still not excessive and aggressive. This dress is extremely simple but perfect for winter holidays since the berry red will look on spot for Christmas along with a furry coat or a simple trench coat; this outfit could be perfect for mature women who don’t like to be at the center of the attention but still want to look glamorous. This second option features bigger white polka dots on a navy-blue dress with matching headband, and a bright yellow cardigan with matching belt. The pop of color is explosive and eye-catching, but still, the garments are simple and easy to wear, making this a valuable option for a younger and fresher modest look during winter. A matching blue trench coat on top would be perfect to complete the outfit.